Perfect-Ply--just the right number of layers. Enough to effectively apply the cleaner and wax without waste. Great for polishing. 3 x 3 inches(7.5 x 7.5 cm)--the perfect size to get in to those tight corners and through ball lanes. Tight Weave--made of premium high-quality 100-percent bleached cotton cheesecloth with a high thread count for best performance. 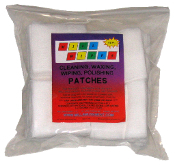 Reclosable Bag--each bag contains 200 wipes--grab what you need while the rest stay clean.